i b i k e l o n d o n: Love London, Go Dutch; Love The Big Ride! Love London, Go Dutch; Love The Big Ride! The skies were grey, a cold wind blew and the rain came down all day. 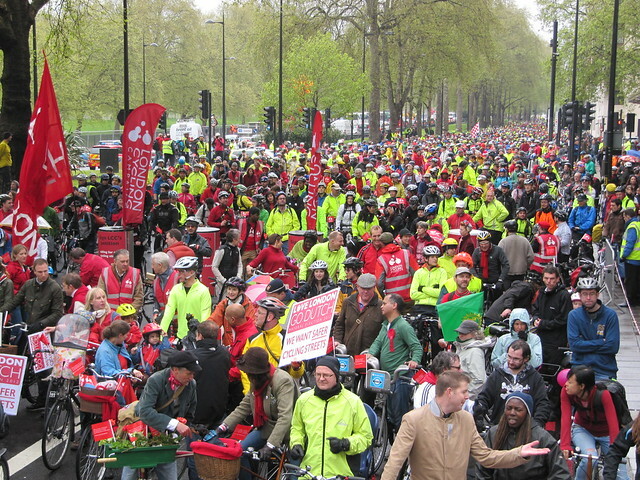 And yet some 10,000 people joined "The Big Ride" by the London Cycling Campaign - the culmination of their Go Dutch campaign - to demand that London's streets are made as safe for cycling as those in Holland. The view from the starting stage - truly phenomenal! The LCC invited me to start the ride with the gorgeous Jen Kerrison from The Bike Show and we were simply blown away by the view from the starting stage - thousands and thousands of cyclists stretching from Hyde Park Corner all the way to Marble Arch, filling Park Lane with bikes of all shapes and sizes. Jen and I start the ride with a bang! 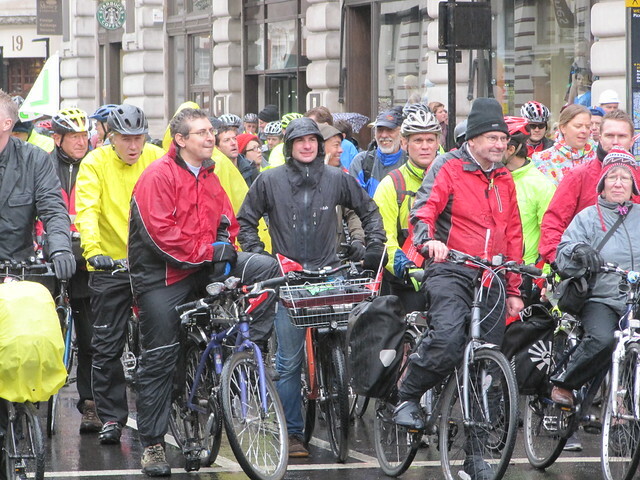 There were many many children, older cyclists and everyone in between - from babies in Bakfiets to OAPs on Omafiets; from the sporty boys of Dulwich Paragon Cycling Club to disabled cyclists from Wheels for Wellbeing - every element of London's diverse cycling society was represented, all united in demanding the same change. 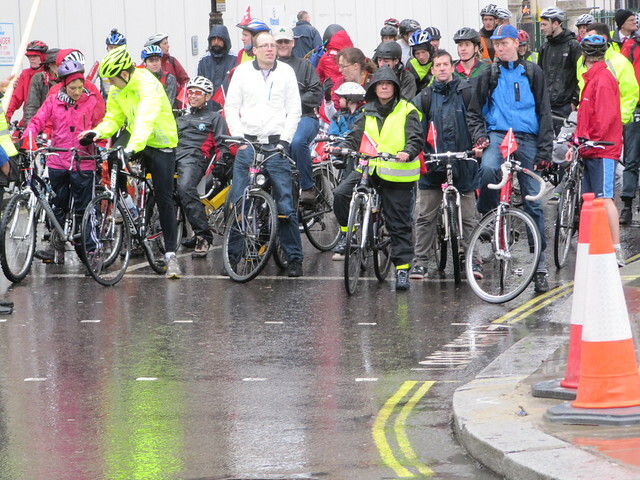 It takes more than a downpour to dampen London cyclist's spirits! Love London Go Dutch shows that campaigns which are aspirational, relevant and exciting really help to pull people in and keep them involved; cycling campaigns across the country could learn a lot from it: it led to the biggest cycling demonstration London has ever seen - can we have more of the same at a national level please? With just 5 days to go till London elects a new Mayor, all of the main candidates have now pledged to support Go Dutch if they win the next term - this is a huge achievement for cyclists everywhere, and the message today couldn't have been clearer; when tens of thousands sign a petition and take to the streets it says loudly and clearly that people on bikes are watching London's politicians and will hold them to their electoral promises. From the middle of the ride - no aspiring London politician could hope to avoid these numbers. Amazing photo by beenbrun on Flickr. 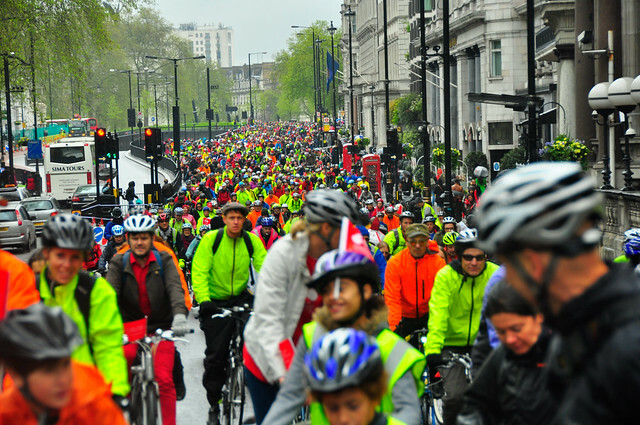 Journalists, radio and television crews from the BBC, Sky TV, The Times, The Guardian, ITN, Dutch and Chinese television were at the start of the ride, which departed with a roar which echoed down Park Lane. 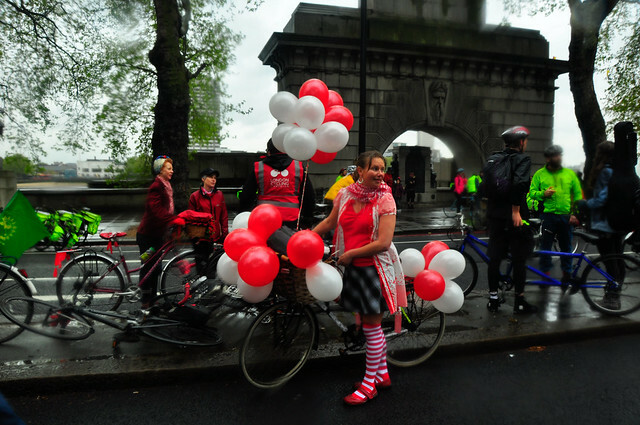 People came dressed in red and white, decorating themselves and their bikes. 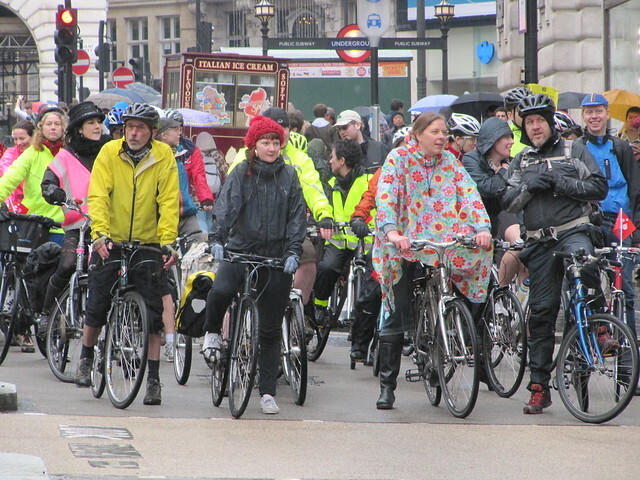 A tribe of cyclists came dressed as bandits, whilst the Hackney Cycling Campaign came dressed as zebras. An enormous yellow wooden boat was cycled along the route as riders dressed as pirates circled. Cargo bikes full of happy, smiling, slightly windswept children - the future cyclists of London - took to the route. 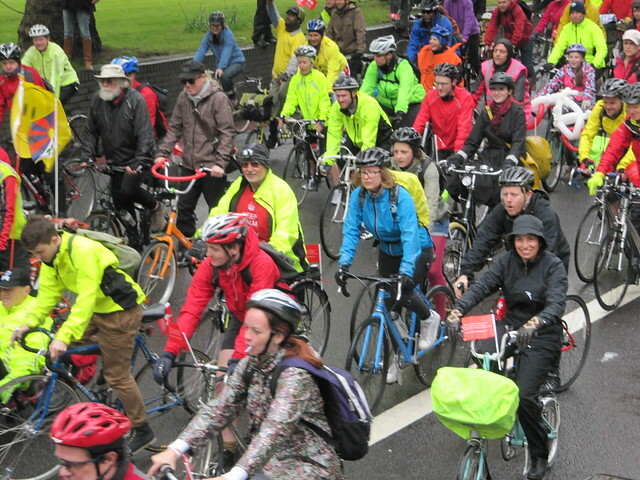 The atmosphere may have been fun and family-friendly but the message was clear; in just a few days time we will all "vote bike", and there is still time for the Mayoral candidates to promise more for cyclists if they want to win us over. 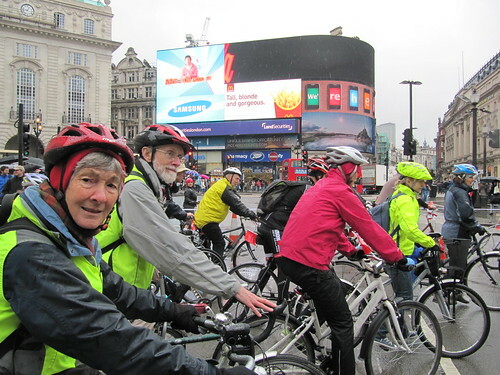 London cyclists of all ages and backgrounds, united. 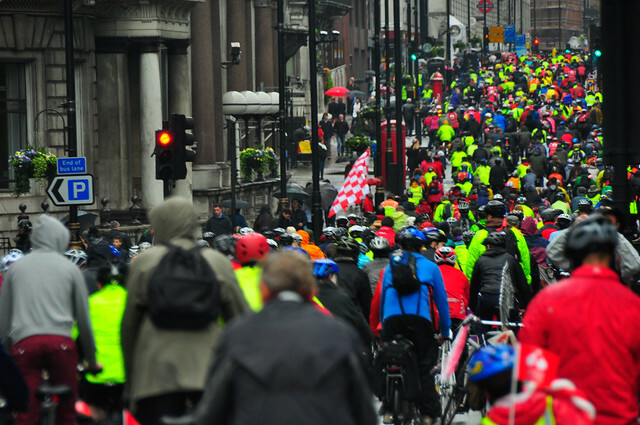 It's been a truly astonishing year for cycling in London - from the battle for Blackfriars Bridge to the pedal on parliament, from the awful tally of 16 cyclists killed on our city roads in 2011 to the unbridled optimism and vocal demands of today. 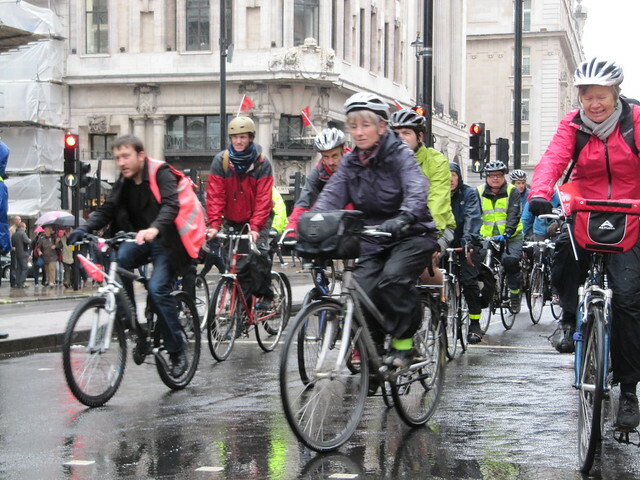 Our politicians ignore cyclists and their safety at their peril. I Love London, and I want it to Go Dutch! There are more wonderful photos on the LCC website, here. Great fun even in the wet. Singing in the rain to that very song on someone's boom box whilst the lady on the crossing in Trafalgar Square waggled her bum was very funny. An amazing day that I will treasure and remember (like Tour du Danger and the Blackfriar's flashrides) for the rest of my life! Thank you so much to one and all who organised and all of the wonderful people who came along too! We can and we will change things! Fantastic day, despite the rain. I can't believe I let my 11-year old ride in London!